Grilled Chicken and Mozzarella Panini. Regarding BBQ Inc.
After a long hard day playing in the snow as a kid, my Mom would fix me a bowl of tomato soup and a grilled cheese sandwich. My Mom's method for a grilled cheese sandwich started with a hot frying pan, two slices of buttered white bread and a slice of that fake orange sandwich cheese. She'd place one piece of bread, butter side down on in the pan, top with cheese and then the other slice of bread, butter side up. Once the bottom had heavily browned, it was flipped over. When that side was equally cooked and the cheese all melted, off it came to be sliced diagonally and placed on the plate with the bowl of soup in the middle. This is probably how most of us were introduced to a grilled cheese sandwich. My only question is, why is it called grilled if it never hit the grill? My method for grilling a grilled cheese sandwich goes something like this: Take two slices of a thin, crusty bread; butter or brush oil on one side of each. Place a slice, buttered or oiled side down, on a medium-hot grill. Put on the cheese and the other slice buttered or oiled side up, and then weight it down with something heavy. After two minutes, remove the weight, flip and replace the weight. After another two minutes remove from the grill and enjoy. The "grilled" sandwich became popular in diners and bar & grills because it was a quick and easy way to make a hot sandwich without a lot of equipment or skill. Everything that goes into it is stored cold and heated all together in a pan or on a griddle. It's flattened for easy to eating and loaded with butter to make it delicious when everything that goes into it is cheap and relatively bland. Now I'm not trying to put down the grilled cheese sandwich. It's still one of my favorite sandwiches. I'm just saying that its creation has humble roots. Weight: For the weight, you need something weighing about a pound or two. You can buy one of those cast iron grill presses or bacon press, but I find that they don't have quite enough weight to be completely effective. You want to smash this sandwich down to a thin layer of crunchy goodness. What I use is a brick. A brick is a wonderful grilling tool. It's perfect for flattening chicken, holding down plates in the wind, and for making a grilled sandwich. Take a clean brick and wrap it in a couple of layers of foil. You will need to be able to pick the brick up and move it, so an oven mitt or towel needs to be on hand. Also, the brick doesn't need to be heated so keep it off the grill until needed. Bread: A good bread for this sandwich is a thin, crusty bread. The bread needs to be dense enough to hold together and flat enough to grill evenly. A dinner roll isn't going to do it. Foccacia and Ciabatta are great for these sandwiches, but day old french bread works well too. Traditionally, this was a great way to use up old bread, so don't need to waste a lot of money on expensive bread. Cheese: Any cheese will do for a good grilled cheese sandwich. It shouldn't be too strong in flavor, but the choice is up to you. The real point here is that you can do so much more than just cheese. Thinly sliced deli meats, tomatoes, grilled onions, and vegetables, fired roasted peppers, or anything else you can imagine. Two things to remember, though. First, keep the sandwich flat. This means not over stuffing it and sticking with thinly sliced items. Second, while you are grilling this sandwich the heat isn't going to cook the items inside the sandwich completely. Everything that goes in should either require no cooking or simply need warming (or melting like the cheese). Now we are approaching what is known as the Panini (panini is plural, panino is singular in Italian) This trendy sandwich has gained popularity in recent years. To be honest, I think the whole thing was a conspiracy of appliance makers seeking to convince consumers that they needed yet another kitchen gadget. It's a perfect solution for coffee shops that want to serve up a hot sandwich but don't have the space (or the trained staff) to do it from scratch. Premade paninis are kept in the fridge until the customer orders it and within a few minutes on a fancy panini press (like an expensive Foreman grill), they have a $10 sandwich. But I digress. However you stuff your grilled cheese sandwich, the process of cooking it is the same. Make a thin sandwich. Butter or oil the exposed side of the bread (probably do this before you put it all together. Place the assembled sandwich on the grill over a medium heat (or a single layer fire for charcoal grills). 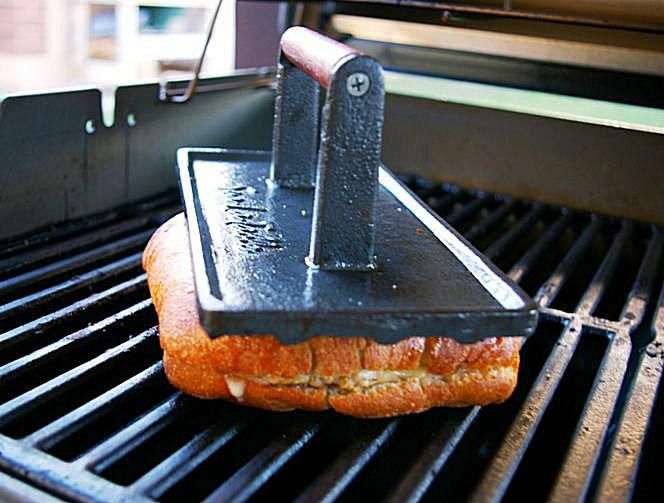 Place the brick on top of the sandwich and grill until the bread on the bottom is browned and has dark (but not burnt) set of grill marks; about 2 minutes. Remove the brick, flip it over and replace the brick to grill the other side. After about 2 more minutes it should be done. Let it rest long enough to cool so you can handle and eat. Absolutely delicious.